REACT EMS is proud to recognize Matthew Bradshaw as a Star of Life 2017. Matt is a Field Training Officer and Critical Care Paramedic who has spent seven years with REACT. Matt is most appreciated for his tireless efforts to work with new Paramedics, developing them into skilled practitioners. To a person, Matt’s mentored Paramedics compliment his ability to help them identify areas to study as well as his ability to help them understand material to a level that enhances their patient care skills. Matt takes great pride in each of his charges, but never seems to overwhelm them with his expectations. A sign of a true leader is one that makes others around him better. Matt Bradshaw is a perfect example of that characteristic. Matt was Active Duty military for six years, and spent four years in the Reserves. He served in the Air Force, Army, and Navy. 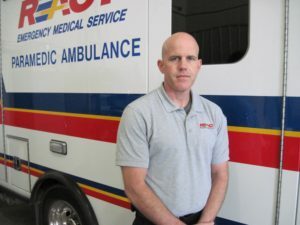 He started his EMS career as his military career ended. He has worked for a variety of EMS organizations, and has been benefiting REACT since 2008. Matt and his wife, Shannon, are the proud parents of five children, ages six weeks to 20 years. Needless to say, they stay busy. Hunter is a junior at Baylor in the School of Nursing. Noah (7) and Jakob (5) are both playing baseball and have plenty of practices and games to attend. Carson likes to go along to baseball games and to the farm to ride the four-wheelers and feed the chickens. The REACT family and all of our patients have benefited from Matt being an important part of our team. We are proud to recognize him as our Star for 2017.